The truce signed by France with Prussia and Russia at Pläswitz on 4 June 1813 expired on 16 August 1813. Both sides had spent most of the intervening period planning and preparing for war, with Austria and Sweden joining the Coalition against France. Napoleon’s initial plan was to capture Berlin, which he believed would demoralise the Prussians and force the Russians to withdraw to the east and away from the Austrians. It would encourage his German allies to remain loyal, reduce the odds against him and relieve besieged French garrisons on the Oder and Vistula. Marshal Nicolas Oudinot was ordered to advance on Berlin from Saxony with 67,000 men and 216 guns. A further 37,500 men and 94 guns under Marshal Louis Nicolas Davout would march from Hamburg to Berlin. The two forces would be linked by 9,000 troops under General Jean Baptiste Girard at Magdeburg and General Jan Dombrowski’s 5,000 Poles and Wittenberg. Oudinot had concentrated his army at Baruth by 18 August. His advance started well, and he won an minor engagement at Trebbin on 21 August. There was now a gap between two of Bernadotte’s corps, Friedrich von Tauentzien’s 4th Prussian Corps and Friedrich von Bülow’s 3rd Prussian Corps, and the road to Berlin appeared to be open. Michael Leggiere notes that Bernadotte feared that he was facing Napoleon himself and lacked confidence in his troops, many of whom were inexperienced, had been retreating and wanted to abandon Berlin. Bülow refused to give up his country’s capital. After a discussion on the morning of 22 August Bernadotte agreed to remain south of Berlin until he was certain that he faced Napoleon, and redeployed his army accordingly. The Coalition’s Trachenberg Plan was to avoid battle with Napoleon, but to try to defeat detached French corps. Oudinot’s army was moving along three roads: his own 12th Corps to the west, General Jean-Louis-Ebénézer Reynier’s 7th Corps and General Jean-Toussaint Arrighi’s 3rd Cavalry Corps in the centre and General http://www.1911encyclopedia.org/Henri_Gratien,_Comte_Bertrand4th Corps in the east. They could not easily reinforce each other because of the swamps and forests that separated the three, but the roads along which the 12th and 7th Corps were travelling met at Gross Beeren. On 22 August Oudinot’s troops forced their way across the Nuthe Canal. There were four crossing points, so Oudinot pinned Thyrow, the strongest, with one of his divisions and sent the rest of the corps against Wilmersdorf. Wietstock was attacked by Reynier’s corps and Jühnsdorff by Bertrand’s corps. The plan, according to Leggiere, ‘worked brilliantly’, and the French took all four crossings. However, Tauentzien followed Bülow’s advice to retreat from Jühnsdorff to Blankenfelde. Leggiere argues that, although this meant the loss of a crossing over the canal, it ‘proved to be a far more decisive position’ the next day. Early on August 23 Bertrand advanced on Blankenfelde. After an initial combat between skirmishers Bertrand’s artillery forced Tauentzien’s raw Landwehr troops to withdraw. Bertrand also fell back, as he believed that the advance of Reynier on his left would force the Prussians to withdraw, thus allowing the French to win by manoeuvre rather than a frontal assault. Tauntzien did not follow up because of the inexperience of his troops, and both corps were back at their start points by 2pm. 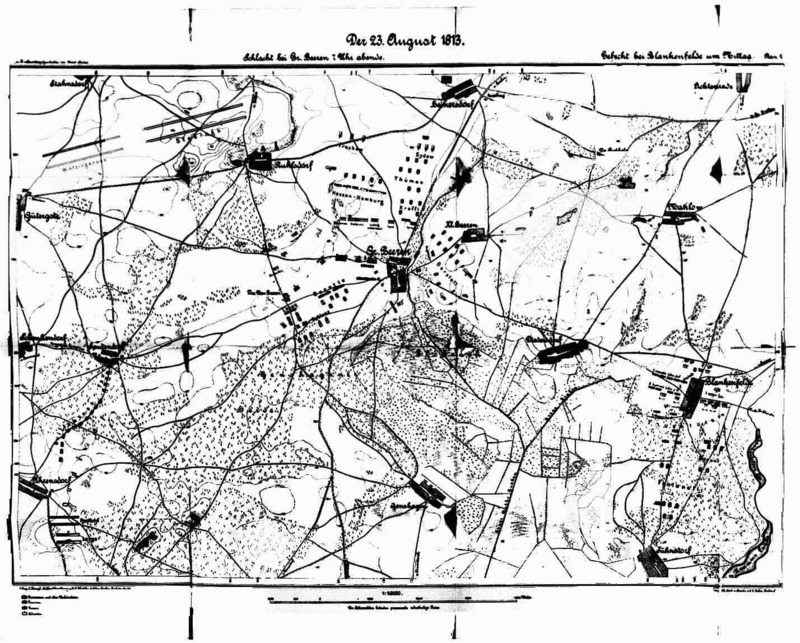 Early on 23 August Bernadotte had ordered Bülow to move his corps further west to Ruhlsdorf. This recreated a gap between Bülow and Tauentzien’s corps that the French could break through and advance to Berlin. By 10am Bülow could hear the sounds of battle to his east, so sent a messenger to Bernadotte asking permission to close the gap. Bernadotte eventually agreed, but then ordered one of Bülow’s brigades, the 3rd, to hold its position because of reports that the French were advancing on Ruhlsdorf. Reports from Blankenfelde convinced Bernadotte that the threat was to his left flank, and he released the 3rd Brigade to join Bülow. Reynier reached Gross Beeren around 3pm and took it easily, before ordering his two Saxon and one French divisions, comprising 27,000 men, to camp for the night. Bülow, who had 38,000 troops, decided to attack. The battle began with an artillery duel that lasted from 5pm to 6pm. It started with 62 Prussian and Russian guns against 44 French and Saxons ones, rising to 80 and 69 respectively as reinforcements arrived. Both sides had therefore suffered significant casualties before Bülow launched his attack against General Sahr’s Saxon division on Reynier’s right. Rain made it impossible for the Saxons to fire their muskets at the advancing French. The Saxons, heavily outnumbered, were forced to retreat. Reynier ordered General Pierre-François-Joseph Durutte’s French division to counter-attack, but it retreated when it encountering the fleeing Saxons. General Lecoq’s Saxon division was also unable to retake the lost ground, and Reynier used it to cover the retreat of his corps, which by 10pm was back where it started the day. The French and Saxons lost 3,000 men and 13 guns and the Prussians 1,000 men. F. Lorraine Petre says that the ‘fight was of no real importance to either side.’ Leggiere, however, argues that it showed that the reforms of the Prussian Army that had taken place over the previous five years had been successful and that it ‘silenced critics who still questioned the combat-efficiency of the Prussia troops, especially the Landwehr.’ He also notes that there was not ‘the slightest hint of pan-German nationalism’ in the attitude of the Saxons. Bülow’s suggestion that Tauentzien retreat to Blankenfelde probably prevented Bertrand from enveloping Bülow’s corps, which would probably have led to Bernadotte retreating and the French capturing Berlin. The loss of both Prussia’s capital and its new army’s first battle would have had dire consequences for Prussian morale. M. V. Leggiere, Napoleon and Berlin: The Franco-Prussian War in North Germany, 1813 (Norman: University of Oklahoma Press, 2002), p. 153. Strengths and casualties are from F. L. Petre, Napoleon’s Last Campaign in Germany, 1813 (London: Arms and Armour Press, 1974, first published 1912), pp. 261-63. Leggiere, Napoleon and Berlin, p. 173. Quoted in Ibid., p. 166. Quoted in Petre, Napoleon’s Last Campaign, p. 264.